Milan, whatever your feelings, is still a key focal point for fashion and retail. The city doesn’t attract the same volumes of visitors that Paris or Rome do, or the romantic accolades, but it is known for its designers, and by association, its shopping. You wouldn’t guess that the largest boutique by selling area in Milan is Burberry’s flagship on Via Montenapoleone, or that it is the second largest Burberry boutique in Europe, after only London. Milanese brands like Prada, Dolce & Gabbana, and Giorgio Armani occupy plenty of prominent real estate in the city, but it’s foreign brands like Louis Vuitton, Hermès, and Burberry which are equally popular for tourists on shopping quests. If you weren’t aware, the sales tax included in ticket prices for goods in the E.U. (VAT) can be recouped by visitors upon their exit from the E.U. with a small amount of paperwork. Through an alumni connection, the SDA Bocconi Luxury & Arts Club was able to tour the store one evening a few weeks ago, guided by the store general manager, Giuseppe Colucci, and his team. First, some background. Burberry is perhaps the most famous British fashion brand, building widespread awareness with an instantly recognizable check plaid motif that it has used at one time or another on every product category conceivable throughout the past 160 years. It is also strongly associated with the trench coat style of outerwear. More recently, the brand has established itself as a formidable competitor to incumbent high fashion and luxury brands by implementing more premium price points than before, a capable creative director, and significantly investing in brand equity elements like flagship stores, selective distribution, runway shows, and sleek advertising. Just this year, Burberry decided to experiment with a new format of seasonal runway show, where the clothing and accessories are available to buy immediately following the presentation. This usurps the traditional model where looks are shown months before they are commercially available in stores and through distribution channels. If you take a moment to analyze this change, it is considerable. Production occurs fully (or partially) before the presentation, and the link between runway looks and what is subsequently distilled down for commercial use is redefined. It also addresses the primary strength of fast fashion brands like Zara and H&M, which have shown they can take inspiration from runways and produce low-cost, low-quality lookalike products in a fraction of the time, beating many luxury fashion brands to market. In the age of immediacy, consumers’ attention spans demand an adjustment of the model: either provide a compelling design worth waiting for, or make it faster. And so, it was with excitement that we descended upon number 12 of Via Montenapoleone, the world’s fifth most expensive street to rent retail space (at an average of €10,000 per square meter per year) to have the full experience of Burberry in 2016. I will admit that my existing opinion of Burberry wasn’t so sweet. I have found that the high-end products (formerly Burberry Prorsum) are too expensive, though they are well made, mostly in Italy and the U.K. The mid-level of products (formerly Burberry London) are pricey as well, primarily work and professional wear. And the core volume line (formerly Burberry Brit) is mostly made in Asia, and is not high enough quality against lukewarm design, often relying on blatant branding, aimed at unsophisticated consumers. Frankly, I only ever considered Burberry when it was on sale. Its leather goods are equally, to me, overpriced and uninspired in design. Objectively, however, the total brand experience is impressive, and Burberry has done an exemplary job of examining its core strengths, and capitalizing on them. For example: a sciarpe “bar” near the entrance, where cashmere mufflers and scarves made in Scotland come in nineteen colors (my favorite is this yellow) and can be monogrammed and embellished with sequins. Continue on to the newest product market for Burberry: beauty. While the brand has sold fragrances for some years, it only recently entered the arena of cosmetics for face, eyes, lips, and also nail varnish. Burberry uses RFID technology to show how shades of polish placed on a pedestal will look on the hands of different skin tones (light-medium-dark), using a digital screen. It was pretty neat to play with! Elsewhere in the store, we saw Floor 1 (women’s RTW, shoes, accessories), and Floor 2 (men’s). 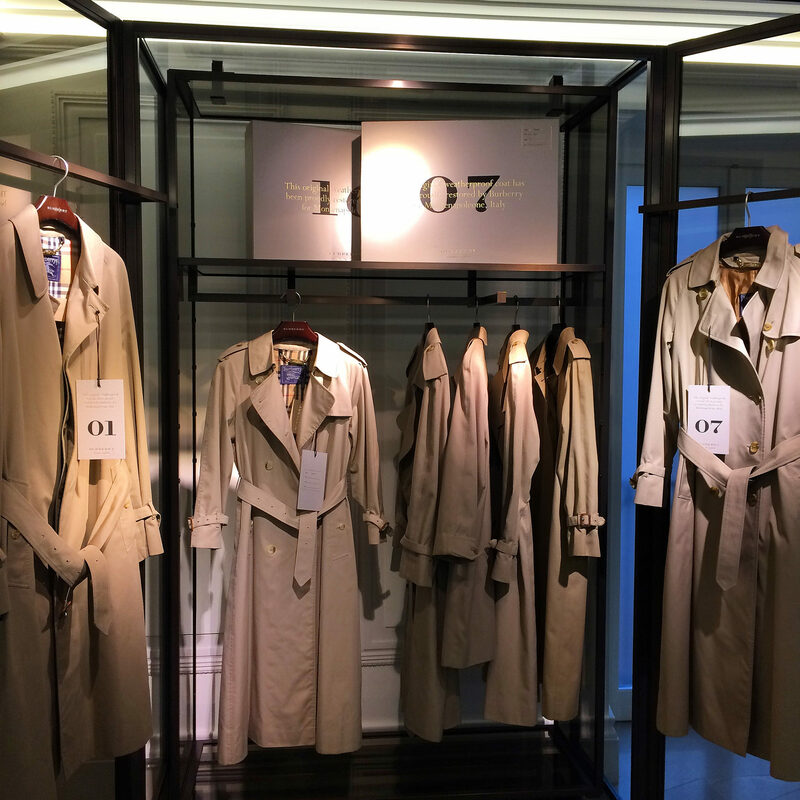 My favorite feature was an installation of vintage trench coats (for sale), which are one offs commissioned especially for Montenapoleone, beautifully refreshed. Not everyone’s taste, but a stylish nod to the brand’s heritage and enduring quality. Also worth noting is the exemplary service and staff at the store. Training is obviously quite rigorous. But Signore Colucci sets the tone, with a wide smile and the warmth Italians are loved for. And while such a cavernous space can’t ever feel truly intimate, on each of the upper floors, private shopping salons can be separated from the public areas for clients who’d like to spread out (and spend). Burberry is also open and explicit about its integration with technology, since each sales associate is equipped with an iPad that aids in inventory management, omni-channel connection, and collecting information from clients. In sum, it was a new view for me of a brand that I’d mostly ignored. Financially it still faces challenges, with lagging sales in Asia and a struggle to design “home-run” products in the same way Gucci, Fendi, and others have done. However, from a retail perspective, Burberry is winning in its execution of interesting, inventive, and thoughtful experiences for clients. At least from a mass market perspective, this is more important than being the “hottest” trendy brand. We thank Mr. Colucci and his team for opening their doors to us; it was a pleasure to spend time inside a flagship store of one of the world’s best brands. It will be fascinating to see how the business evolves. enjoyed this well written article Alex. You inspire with your commentary on leading brands.